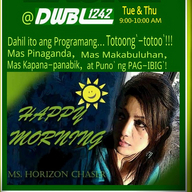 "Happy Morning Program on DWBL 1242 Khz"
"HappyMorningProgram" that showcases any topic under the sun from current events, health, inspirational lifestyle, business. It's a program suited for all ages. HAPPY MORNING PROGRAM IS BACK!